The APC Thermal Containment for Hot/Cold Aisles is an intelligent thermal containment solution designed to increase cooling system efficiency while protecting critical IT equipment and personnel. APC Thermal Containment for Hot/Cold Aisles solutions can eliminate hot spots and provide energy savings over traditional uncontained data center designs. The best containment solution for an existing facility will depend on the constraints of the facility. While ducted hot aisle containment is preferred for highest efficiency, cold aisle containment tends to be easier and more cost effective for facilities with existing raised floor air distribution. Reliability will be increased by preventing hot spots. Containment can prevent the mixing between hot air and cold air, which can provide a lower uniform IT inlet air temperature for IT equipment to reduce hot spots. 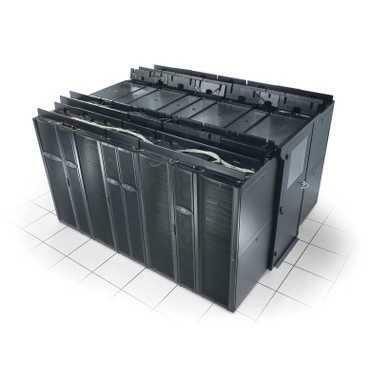 Rack power density can be increased by eliminating hot air recirculation. For a traditional, uncontained raised-floor data center, rack power densities are typically kept below 6kW/rack average to help prevent hot IT exhaust air from re-circulating back into the front of the IT equipment. After containing and sealing the holes to eliminate hot air recirculation paths, rack power densities can increase without the threat of hotspots. Cooling capacity will be increased by increasing the “deltaT” (i.e. the difference in temperature between the cold supply air and the hot return air) across cooling units. For a traditional, uncontained raised-floor data center, more than 50% of the cold air supplied from the cooling units will bypass back to these units directly as a result of any leakage paths that exist. After contained, supply air will instead go through IT equipment where it will absorb heat energy and transport it back to the cooling units. The higher exhaust air temperatures will lead to a bigger deltaT across cooling units, which can increase the cooling capacity about 20% or more. Cooling system energy savings will be increased by being able to shut down cooling units that become redundant as the result of effectively separating hot and cold air streams through the use of an air containment system. Additionally, economizer mode hours are increased. When the outdoor temperature is lower than the indoor temperature, the cooling system compressors don’t need to work to reject heat to the outdoors. The Active Flow Control (AFC) available in the APC EcoAisle Containment system provides the intelligence to communicate to the cooling system in order to right size the cooling airflow to match the load of the IT equipment, providing a reduction in fan energy over conventional cooling systems. The EcoAisle system adapts to varying rack heights, aisle widths, and rack depths to support either hot or cold aisle containment. The Air Return System of the EcoAisle provides a centralized hot air return path for room based CRAC/CRAH units or external air handling systems. The optional UL723s listed Fire Safe System uses temperature sensors to drop ceiling panels in the event of a fire. The Fire Safe System can also be used in conjunction with a field supplied smoke detector to activate in the event smoke is detected with the aisle. EcoAisle provides a safe and efficient environment for IT equipment and personnell incorporating additional features for high efficiency LED lighting with motion detection. EcoAisle can be deployed in zones or modules to gain the benefit at either the rack or row level. Air Return System – Centralized hot air return system for room and external air handling systems minimize obstruction of lighting into the aisle and provide cable access from within the contained aisle. Modular strategy – Modular design of the mechanical and control systems allow for gradual build-up of the cooling infrastructure to match the cooling demand of the facility. This greatly reduces CAPEX expeditures and provides deferred investment throughout the life of the facility. Ceiling tiles – Closes off the top of the aisle to prevent mixing of the hot and cold airstreams in the IT environment. Fire Safe System – Alerts personnel and drops ceiling panels based on temperature to enable fire suppressions system in the room to extinguish the fire. UL723s listed. Modular design – Modular design provides scalable solutions to add cooling as demand increases. One-way locking door – Secures the hot aisle while allowing for quick exit in case of emergency. Scalable densities – Allows for higher densities to be achieved by integrating containment with room, row and rack cooling system architectures. Active Airflow Control – Monitors and actively adjust cooling unit airflow in containment systems, while providing visibility to effective cooling to critical IT equipment. Efficiency – Increases the capacity of the air conditioner by supplying a warmer return air temperature.